The new year is a pretty exciting time for lots of us, January is the one time of year where we can really lean into a love of planning and dreaming and goal setting. The magic of fresh starts and clean slates always holds a very powerful burst of momentum and energy for me, so I'm making the most of it by really diving into a season of uncovering purpose and clarity. Since 2019 is the first year I've opted to use a single word as part of my planning for the months ahead, I thought I would share a little of my reasoning behind it and some tips on making a word for 2019 work for you. The process of figuring out your word can actually be a great tool for digging into your purpose and gaining a sense of clarity over what you want to achieve this year. You can start, like I did, by reflecting on the year before - include your triumphs and successes as well as any learnings or points for improvement. 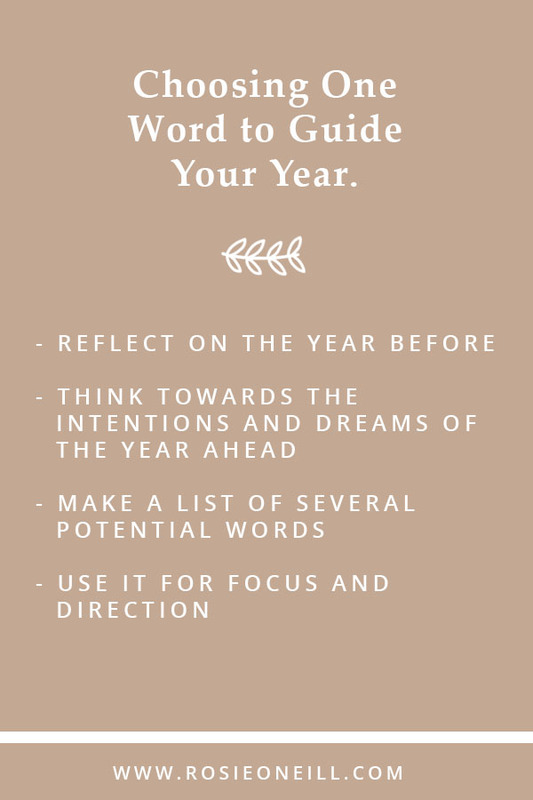 When you choose your word it can therefore be something that encompasses the previous year, but in a way that will help you channel your intentions for the year ahead. Maybe you'll identify that you'd like more 'joy', or 'growth' or 'courage', in your year to come. Choose a word that speaks to you and your lifestyle (or hopes for a lifestyle to come), choose a few and narrow it down from there, let it sit for a few days before you make your decision. Whatever method you use for choosing a word, and whatever word you decide on, the real key is actually using it. As with all planning, goal setting or resolutions, a word for 2019 won't do you any good if it's left neatly on the pages of your journal for the year. I'm hoping that choosing a word for the year will help me in two major ways: focus and direction, so you might like to use those as a starting point for putting your word in action, too. If you find it easy for your goals and plans to become derailed, if you struggle with consistency, you can use the word you choose to guide you and your decision making. Keep the word in mind when you come up against a stumbling block or distraction, use it to keep you on track and mindful of your bigger picture. Use the word to uncover and build some intentional habits into your routine. For example, if your word is 'Joy' - what simple, daily task would bring joy into your life? Maybe it's getting to bed half an hour earlier so you can read more books? Maybe it's taking a breath of fresh air in the middle of the day instead of eating lunch at your desk? And my word for 2019? - that the process and consistent work I'm putting in will move me closer to the dreams and success I hope for. Have you set a word for 2019?